NEW Teddy Bear Wall Stickers	There are 10 products. 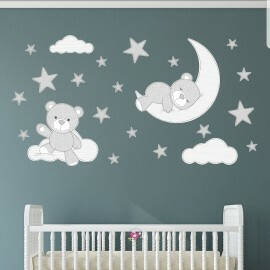 They're cuddly and cute, and so much fun - Premium self adhesive fabric nursery wall decals featuring a sleeping teddy bear on a squishy moon, a bouncing bear on a fluffy cloud and lots of twinkling stars. Simply peel and stick to create a magical space within hours! 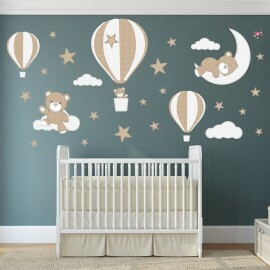 They're cuddly and cute, and so much fun - Premium self adhesive fabric nursery wall decals featuring a sleeping teddy bear on a squishy moon, a bouncing bear on a fluffy cloud and floating in a hot air balloon with lots of twinkling stars. Simply peel and stick to create a magical space within hours! Registered in England and Wales as Enchanted Interiors Ltd No. 10618734.